Why did I dislike Drop by Drop? It’s a small-town soap opera which is boring, has few likeable characters, and offers no challenges or insight. The melting plastic premise is kind of cool but instead of doing something really interesting with it, it seems to be used as a platform for (1) the male characters to mansplain to the female characters how plastic is used in so much of our technology and (2) Llywelyn to express nostalgia for the good ol’ days when people had no internet and actually had to talk to each other. Despite the modern setting, the story feels confusingly old-fashioned. The town feels like it only has about 25 citizens in it. There’s a patriarchal structure where gender roles are dated (the men run the town and are always explaining things to the women) and there’s little diversity. The few children and teens are whiny and immature, not treated like they might know or contribute anything. The dialogue sounds like these people are living in 1950. I think that Morgan Llywelyn, who is now around 80 years old and widely and deservedly lauded for her beautiful historical fiction, has not successfully made the jump to science fiction. For a better treatment of the technology-regression plot, see Island in the Sea of Time by S.M. Stirling (though I don’t recommend its sequels). 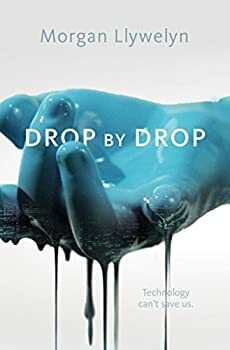 The audiobook version of Drop by Drop (Blackstone Audio) is narrated by Hilary Huber. She has a lovely voice and gives a nice performance. In the next STEP BY STEP novel, Inch by Inch, metal will fail. That sounds disastrous and interesting, but I probably will not be there to see it happen. Publication date: September 25, 2018. In this first book in the Step By Step trilogy, global catastrophe occurs as all plastic mysteriously liquefies. All the small components making many technologies possible ― Navigation systems, communications, medical equipment ― fail. In Sycamore River, citizens find their lives disrupted as everything they’ve depended on melts around them, with sometimes fatal results. All they can rely upon is themselves. And this is only the beginning . . ..
I’m indulging my novelist-mind here, and imagining that this was a book she wrote years/decades ago and could not sell at the time. She (or someone) waited, updated it a little, and got it out there. “Metal failure” would be interesting and could be action-packed if it didn’t turn into REAL HOUSEWIVES OF PLYWOOD TOWN. But then…the termites come, and eat all the wood, everywhere!! So it would become REAL HOUSEWIVES OF SITTING AROUND ON THE GROUND, LOOKING AT THE SKY, HOPING WATER DOESN’T VANISH NEXT. Kat – have you read SM Stirling’s ‘Dies the Fire’? It is the same event/change as Island in the Sea of Time but located in Oregon. The first few are excellent and then it gets too far down the family tree for the characters to be as interesting as the first generation were. April, I have these but haven’t read them. I’ll move them further up my list. It’s disappointing to hear about the ‘soap opera’ tendency. The technological implications are tickling my archaeological background. Leaping ahead in the progression (regression?) can I anticipate a version of Dart’s “osteodontokeratic” culture? It’d veer into horror territory if hide/skin were ultimately to fail. Becky, it’s a series, so I wonder if each book has something different failing? I agree that it’s an intriguing premise. Just not done well, unfortunately.